Nouns and adjectives not only enrich one’s grammar skills, but they enrich one’s vocabulary too. 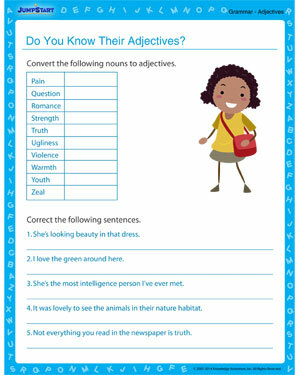 Here is a grammar worksheet that has a number of nouns that need to be converted into their respective adjectives. Along with the conversion exercise, there is a little ‘correct the sentences’ section where kids will love playing the teacher! Download the free grammar worksheet and have fun!